We can help you deal with any drainage issues your septic system runs into in Polk City, FL in an efficient, affordable manner. 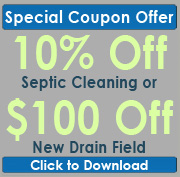 Many different components of your septic system deal with drainage on a daily basis. For example, when wastewater is released into your pipes, the drainage flows into your septic tank and then eventually makes its way out to your property’s drain field. If your septic system is unable to handle this drainage effectively, you need to get it fixed right away. This is where our team at Southeastern Septic LLC comes in. We can help you deal with any drainage issues your septic system runs into in Polk City, FL in an efficient, affordable manner. When we come and provide you with service, our main goal will be to restore the functionality of your septic system as quickly as we can. However, there are several things you can do on your own to keep drainage problems from developing. For example, we highly recommend turning to us on a regular basis to have us come and pump out your septic tank. We also encourage you to allow us to provide you with consistent drain cleaning services. If you aren’t entirely sure that you have a drainage problem, we would be more than happy to come and inspect your septic system. Remember, it is always better to turn to us for help instead of ignoring the issue. If you’d like to know more about what we can do to keep your home’s drainage system up and running, give us a call at Southeastern Septic LLC today. We are dedicated to providing you with excellent service. If you are in need of drainage services in Polk City, Bartow, Lakeland, Mulberry, Zephyrhills, Polk County, Winter Haven, Plant City, or Auburndale, give Southeastern Septic LLC a call today!